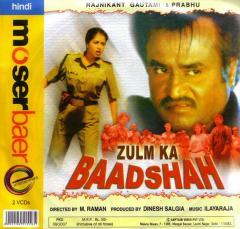 Description: Guru (Rajinikanth) and Babu (Prabhu) are two friends and petty criminals. They end up in jail and come across an innocent man Manohar ('Mannvaasanai' Paandiyan) who tells them that his sister was raped by Muthuraaj (Radha Ravi) and who had killed a taxi driver (witness) with the help of foolish corrupt police officer Nallasivam (Vinu Chakravarthy) and pinned the murder on Manohar. Manohar is sentenced to death row for the killing by the court. Guru and Babu believe in Manohar's story and decide to find the truth and prove his innocence once they get out of jail. Guru fractures Manohar's hand so that his death sentence would be delayed, until it heals, under law. Guru and Babu get released from prison and set in motion an elaborate plan to convict the real killers.Guru (Rajinikanth) and Babu (Prabhu) are two friends and petty criminals. They end up in jail and come across an innocent man Manohar ('Mannvaasanai' Paandiyan) who tells them that his sister was raped by Muthuraaj (Radha Ravi) and who had killed a taxi driver (witness) with the help of foolish corrupt police officer Nallasivam (Vinu Chakravarthy) and pinned the murder on Manohar. Manohar is sentenced to death row for the killing by the court. Guru and Babu believe in Manohar's story and decide to find the truth and prove his innocence once they get out of jail. Guru fractures Manohar's hand so that his death sentence would be delayed, until it heals, under law. Guru and Babu get released from prison and set in motion an elaborate plan to convict the real killers.